It was love at first sight when Leigh-Ann Davis encountered Peppy, her 10-year-old Appendix gelding, for the first time. 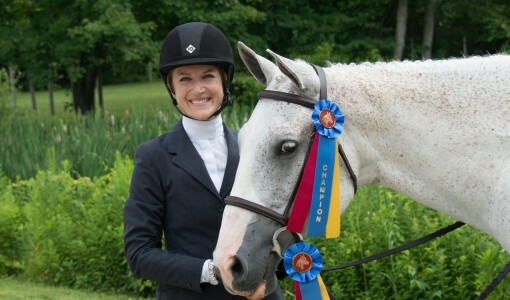 Originally her father-in-law’s horse, Leigh-Ann had Peppy shipped to Connecticut from Texas in 2008. 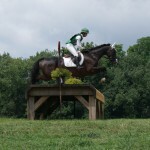 “I had been riding for 16 years and Peppy was the first horse I had ever owned. Being a military wife away from all of my family besides my husband, Peppy became an integral part of my life and family,” she says. 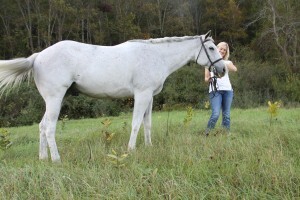 In September of 2012, Peppy would make his first trip to Tufts Hospital for Large Animals at Cummings Veterinary Medical Center for an MRI, with a diagnosis of bilateral navicular bone avulsion fractures, along with navicular bone degeneration. Together with Peppy’s primary vet, Dr. José Garcia Lopez developed a 10-month treatment and rehab plan for him. But in July of 2013, when Peppy was still lame despite proper healing time and extensive treatment, the decision was made to proceed with a neurectomy, performed by Dr. Thomas Jenei. Bad luck would strike again when, in mid-August, Peppy hyperextended his knee in his stall—resulting in a chip fracture of his left knee. A second accident with the same knee would mean arthroscopic removal of what was now two bone chips was Peppy’s only hope for soundness. 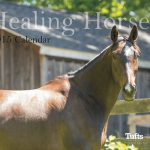 In December of 2013, Peppy made his third trip to Tufts Hospital for Large Animals in just over one year for his knee surgery. “Throughout all of Peppy’s visits to Tufts and in between, Dr. Garcia continued to monitor his progress and setbacks, and continues to consult with my primary vet any time we need him,” says Leigh-Ann.